In the game there are eight characters. They are the champions that have been chosen to represent their people in the race. 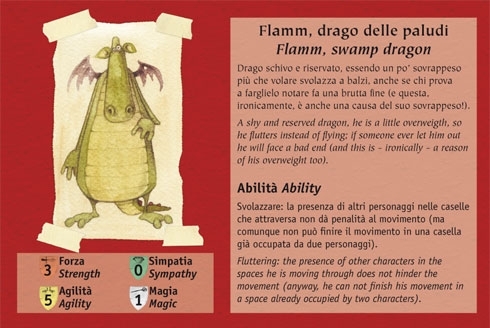 Each character has four Characteristics (Strength, Agility, Sympathy, and Magic) and also has a special Ability according to his race. The Characteristics are indicated with a number (the higher the number is, the stronger the character is in that Characteristic) and are used to determine outcomes in Challenges with the Creatures that are encountered along the way, and to overcome other difficulties. 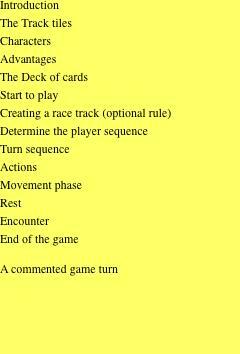 The Ability can be used - depending on the player's choice - only once per turn. Success when using the Ability is automatic.